HALT THE VERMONT FRACKED GAS PIPELINE! 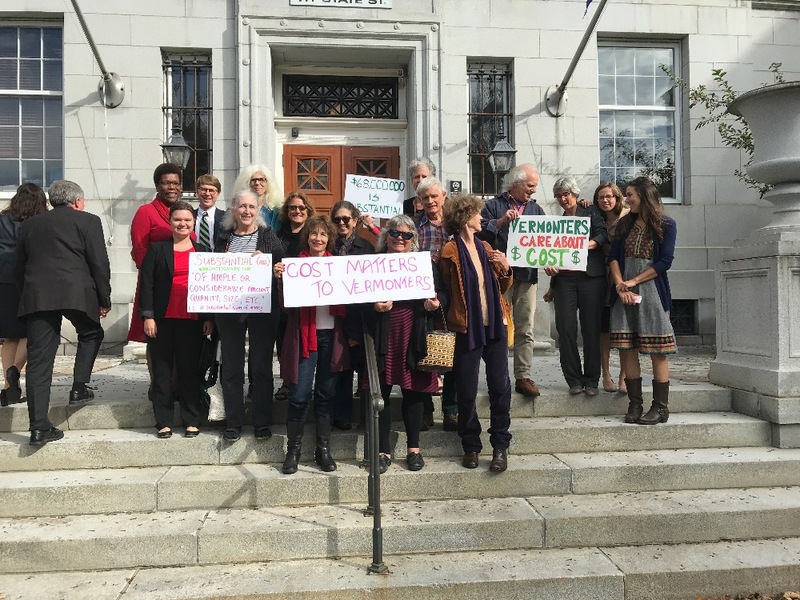 We are a group of concerned citizens who have come together to keep Vermont Gas, owned by Canadian Gaz Metro and Enbridge, from building a fracked gas pipeline through Vermont, including through a small public park. In this David and Goliath contest we find our small community pitted against some of the world’s largest fossil fuel interests. The Vermont Gas pipeline is not just a local concern. The pipeline is ultimately aimed to supply gas beyond Vermont and for export beyond U.S. borders. Resisting the development of fossil fuel infrastructure is an act of love. It is love of the water, air, earth, our children and grandchildren, all creatures great and small. It is up to us. Now is the time! Fighting Vermont Gas’ pipeline is our act of solidarity with the water protectors of Standing Rock, who are opposing the Dakota Access Pipeline, under construction by some of the same insatiably greedy companies. The current invasion of pipelines across our country is destroying our lands and contaminating our waters. Building more pipelines only locks us onto a path to climate catastrophe that robs our future. We have been fighting the Vermont Gas pipeline in the courts and on the streets. Our legal case is now under appeal at the Vermont Supreme Court. We have held off construction for 10 months so far and counting! But we need your help to keep the "black snake" from passing through our public park and continuing on its' way across Vermont and beyond. Please donate to support our legal fund. THANK YOU FOR YOUR SOLIDARITY AND LOVE! astoundingly, we have now learned that Vermont Gas failed to comply with the law requiring them to have a licensed professional engineer undertake a comprehensive review of all plans, and affix his/her seal to those plans, in effect taking responsibility for their safety and viability. You may recall the horrendous gas pipeline explosions in Andover County, Massachussetts earlier this year. One person was killed, many were injured, and several homes burned to the ground while others were damaged. The National Transportation Safety Board advised that Massachussetts do away with an exemption that allowed them to undertake construction and maintenance activities without licensed engineer approval. They stated that the exemption “foreclosed an opportunity to detect the design oversight” that led to the disaster. Vermont does not have the same exemption - by law, VGS was required to have a professional licensed engineer review and provide his/her seal to all construction plans. But VGS did not do so, stating they were “unaware of such a requirement”. Worse yet, VGS had falsely assured citizens and the commission during evidentiary hearings held back in 2013 that they would (as they should) have licensed engineers engaged in the planning and construction. This lack of expert review comes as no big surprise to those who have been observing the rushed and reckless construction. We have requested the commission order VGS to “show cause” why they should not be required to shut down the pipeline until and unless they have a licensed professional engineer approval on all construction plans. VGS should follow the law, and in failing to do so in this case they seriously endanger our safety. * In Bristol, when townspeople learned their Selectboard was moving to approve VGS gas distrubution lines through the town, without proper opportunity for citizens to vote on the use of town rights-of-way, they took action and filed a suit against the town. Now VGS is saying they may not even attempt to construct those lines given challenges to their permits! It’s GIVING TUESDAY! Marking the end of a crazy year… The IPCC again has warned us that we are going headlong over the cliff into climate chaos. Did you read this? “Pipeline Wars: The Frontline in the fight against climate change” It is so true. Fighting pipelines is perhaps the single most important thing we can do right now. PLEASE DONATE TO SUPPORT THE FIGHT! As Bill McKibben made clear in his recent article in New Yorker, the fossil fuel industry is fine with destroying planet earth rather than hampering their profitmaking! And We know that if we do not keep the gas in the ground and the oil in the soil, we are essentially doomed. Here in Vermont we have been fighting long and hard against the largest fossil fuel infrastructure project in the state, the Vermont Gas ANGP pipeline. It is a matter of life and death - both because of the climate impacts of fracked gas AND because of the reckless and irresponsible construction that has left us with a mega threat to our safety. An appalling lack of accountability has led to reckless construction problems throughout construction of the ANGP. Citizens have had to do the work of our DPS which appears more interested in providing cover for Vermont Gas and their owners than protecting public interests. Through intense hard work and many public record requests we documented and detailed to the PUC (in more than 900 pages) the numerous, systemic construction problems. Now that PUC has ordered an independent investigation, we need your support to keep the pressure on and hold them to it! Just recently our lawyer submitted yet another filing in the investigation case - after learning that Vermont Gas and their friends at DPS appear to have failed to follow the law requiring that a licensed professional engineer take responsibility for, sign off on and affix his/her seal on, all of the plans, diagrams and specifications as “issued for construction”. Ongoing, changes to the plans for construction must also be reviewed and given a stamp of approval by a responsible licensed engineer. This is intended to instill responsibility and accountability. After the granting of the certificate of public good for the ANGP, and throughout construction, there were many changes to the plans for ANGP construction. Those appear not to have been reviewed by any licensed engineer, or in most cases ever even reported to the PUC. Investigators looking at the cause of the recent gas line explosion and fires in Massachussetts stated that disaster could have been avoided if that pipeline project had been subjected to comprehensive review and approval by a licensed professional engineer. We need to keep pushing back against VGS pipeline - which is our best local opportunity to push back against the entire fossil fuel industry. We cannot give up now, with friends and neighbors living in close proximity to this monster and our own, and our kids future on the line! Update: PLEASE CONSIDER A HOLIDAY DONATION TO OUR WORK!! We have been VERY busy since last we updated our supporters! We've filed multiple public record requests and sifted through thousands of pages of documents from Vermont Gas pertaining to the shallow burial of the pipeline under streams and in a swamp in New Haven. We've learned a lot...and grown increasingly concerned about the safety of people living near the pipeline. Among other things - we have discovered that VGS altered safety specs as they went along to make the project cheaper and easier. You may have seen that the Public Utility Commission has now ordered an INDEPENDENT investigation of the pipeline depth. But depth is not the only concern. We are finding many other aspects of construction where it appears that VGS cut corners. Our lawyer, Jim Dumont, has interviewed several companies that worked on the pipeline, and yesterday took a 4-hour deposition of the construction superintendent--he told us the construction company had virtually no records! So now we have to go hunting for those records. Assuming they exist. 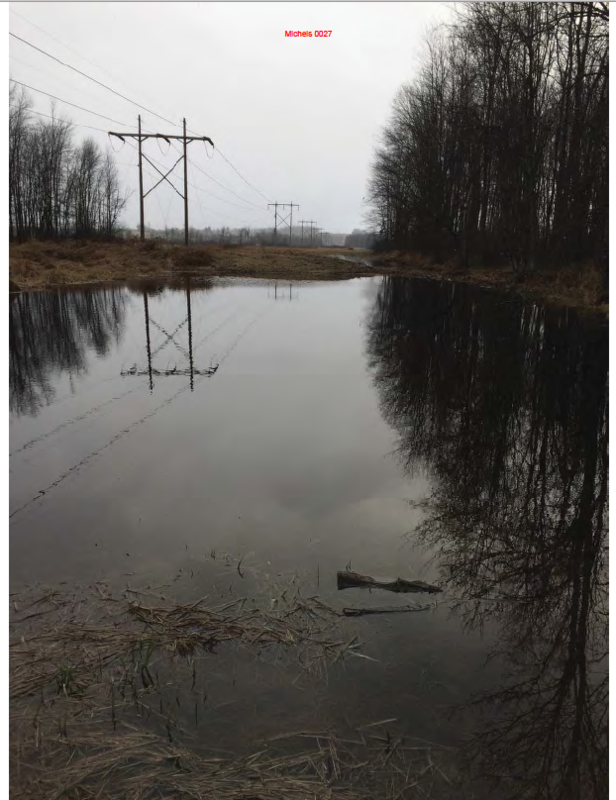 The attached photo is of the pipeline under water in a swamp after pipeline construction, along the VELCO transmission wires. Not good! We are not backing down. Thousands of hours of our time, thousands of dollars in legal fees - but we will prevail. 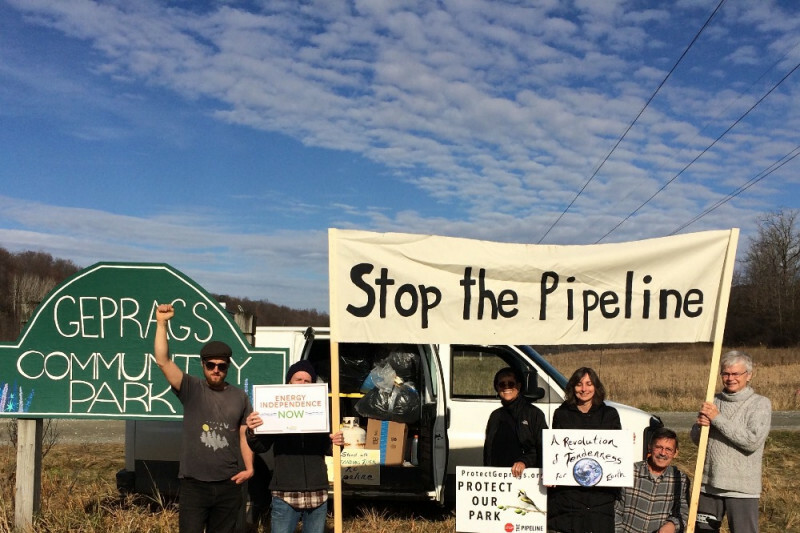 Please help out - we need your support - give the gift of stop-the-pipeline this holiday - and thanks to all of you have already donated! On Tuesday, the Public Utility Commission held a status conference on the case regarding Vermont Gas failure to bury the pipeline to proper depth. Our lawyer requested an evidentiary hearing, discovery and a public hearing with presentation by the intervenors, not just the company- ALL OF THESE were granted! YAY! And the next day Conservation Law Foundation argued their case that a doubling of costs for the pipeline is a "substantial change" that should have triggered a permit review! Meant to contribute $250 to begin with . . . Ongoing thanks to all of you! I continue to appreciate the courage and perseverance of everyone on the front lines of this effort that affects so many of us in the wider collective. Many thanks to all of you! Thank you for all of the endless hours on this - we all appreciate the fight against the fracked gas pipeline, and much has been uncovered ( no pun intended) on VGS' questionable methods, and more will be revealed.